You see, this covert was marred by the rugged flows of lava 2000 years past, but is now interspersed with islands of sage brush. To the untrained eye, this place seems like a barren wasteland–a moonscape if you will–hence its name. But to a bird hunter willing to put in some leg work, there is more than meets the eye. 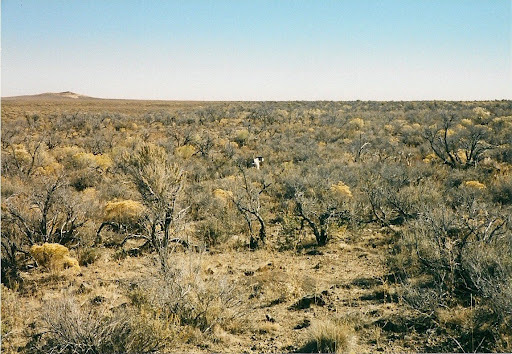 Huge flocks of sage grouse live in this unique area. Every year, my family and I get together for a few days of hunting with our dogs for the variety of gallinaceous birds throughout southern Idaho. I have come to call this sacred time together our “Holy Jihad on the Gallinations.” We all look forward to it every year. 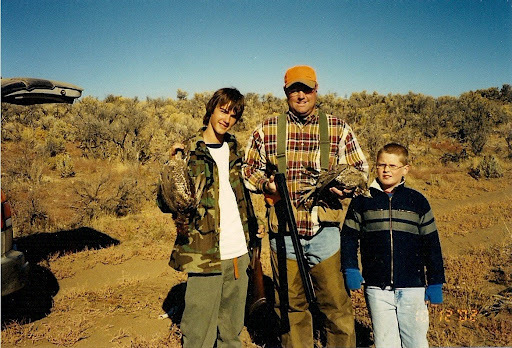 In “The White Wonder: Sniff it up Boys!” (see below), I wrote about one phenomenal day in October of 2002, during my family’s annual crusade in pursuit of Idaho’s smallest upland game bird–the valley quail. The very next day, we decided to pursue Idaho’s biggest, the sage grouse. 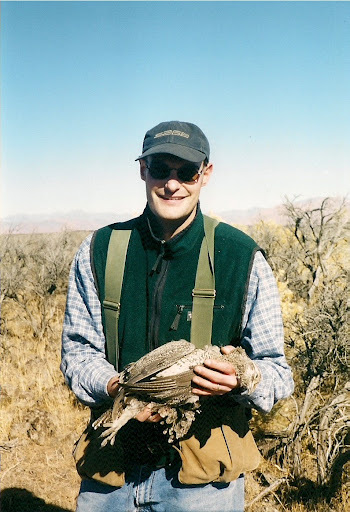 In fact, in Western Skies, John Barsness, refers to these huge grouse as “Pleistocene Megagrouse, too big for the now.” Before this day, although I had hunted sage grouse and even helped Idaho Fish & Game trap some for studying, I had never harvested one so my excitement and expectations were high. Present with me on this leg of the hunt were Shawn, Eric, my nephews Joshua and Dylan, and Farley, my Elhew pointer. 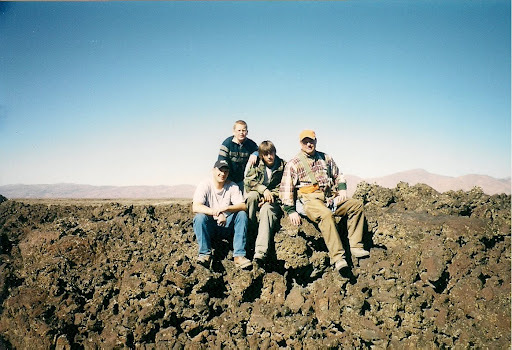 As we drove to our destination through the lifeless lava flows, we were blinded by the rising sun to the east. 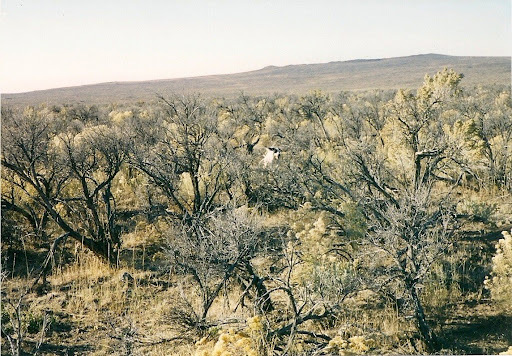 But upon approaching the first oasis of sage brush in the midst of the rugged flows, we witnessed, through the suns glare, a “Roadside Revelation” as a few almost turkey-sized grouse nervously crossed the road and then flushed into the distance. Considering this as a good omen, we continued on to our planned hunting spot. Upon reaching the covert, however, Josh and Eric realized that they did not have the requisite sagegrouse permit as required by Idaho law. After a short deliberation, we decided to have Eric and Josh drop us off and take “Monty,” my gold Mitsubishi Montero, back to the nearest town to purchase their sage grouse tags. As the vehicle and the dust faded away, the rest of us followed Farles on foot into the barrens. In a shallow valley, we quickly saw two grouse flush wildly out of range. We followed Farley up onto a small ridge where he soon slowed to a stylish point facing a thick stand of waist high sagebrush. Feeling confident from some great shooting the day before, I thought: This should be easy. As if in slow motion, a large flock of sage grouse lifted thunderously from the ground. Startled, I promptly emptied my gun into the sky without touching a feather. Shawn, on the other hand, made a good shot on a big bird-of-the-year. Farley, swimming in a sea of sage. If the previous day was one of my best shooting days (in which I harvested eight quail), this day was one of my worst. In short order, I repeatedly missed birds on my first seven shots. Totally demoralized, I began to take out my frustration on far-running Farley. It did not take long before my young-but wise-nephew Dylan said: “Uncle Andy, quit yelling at your dog. You’re just mad because you can’t shoot worth a darn!” Convicted by my own conscience, I could not argue with the little guy. After I calmed down a bit, another big flock got up and on my eighth shot, I finally winged a grouse that was quartering right to left. Knowing that the bird was only injured, I hollered: “Farley, go get that bird!” With absolutely no question as to what I wanted, Farles tackled the running bird and brought it to hand. That little white dot in the middle is Farles on point. Double click on the picture to see his style. Once we finally circled back around to our starting point, Eric and Josh soon arrived. Young Josh stepped from Monty with a huge grin and quickly pulled out by the feet a sage grouse that he had harvested not far from the roadside and with only one shot. Talk about beginner’s luck! Big birds = Big Smiles. “Giant birds are what you take, Walking on the Moon”- My first sagegrouse. Great story. I know that area you speak of and it is quite desolate and apply named. Terry, Thanks. I thought some people might figure out the general location of which I speak. Mums the word! haha! That was a great day…I was thinking that I shot a grouse there with my 28 bore but that was the following year! I was using dad’s 20 bore sxs and was lucky to have shot better than you that day! Shawn, I totally remember when you shot that bombers with your pee-shooter .28. Frankly, I was surprised that “Brandy” handled that big male bird with such authority. I believe that was in 2003 as you mentioned. You were the only one that harvested a bird that year as we did not see as many. Okay–let’s have the straight scoop now. Just when was “roadside revelation” coined? It appears now and then. The day it was invented should be a state holiday in Idaho!